And the winner is … me? 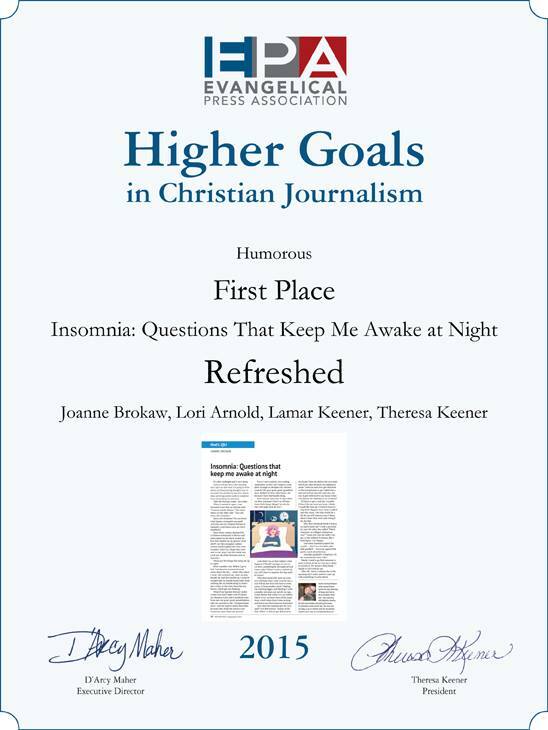 Imagine my surprise this week when, while congratulating writing and publishing friends on their wins at the recent Evangelical Press Association Awards in Denver, I scrolled through the list of Higher Goals winners in the Humorous category and saw who won first place – ME, for my column “Insomnia”. I had forgotten then the publishers of Refreshed Magazine had entered my columns in this year’s contest. I was surprised at not only the win, but … first place?? Lamar and Theresa Keener, publishers of Refreshed Magazine, took home numerous EPA awards and deserve loads of congratulations for their hard work and dedication to putting out such a high quality magazine. I’m honored that they include in their Refreshed family! Buckets and buckets and buckets of gratitude are due my editor, Lori Arnold, for her patience, grace and willingness to put up with my quirks and writers block. There’s no greater blessing a writer can have than an excellent editor who laughs at her jokes. This is my third EPA award, but whose counting? Well, I am, because if I’m being honest I’m still always amazed that people read my scribbling. The biggest thanks, of course, goes out to you, dear reader, for reading my musings and ramblings so that I don’t have to get a real job. This entry was posted in Awards, humor, Writing and tagged Evangelical Press Association, humor, Refreshed Magazine, writing. Bookmark the permalink.